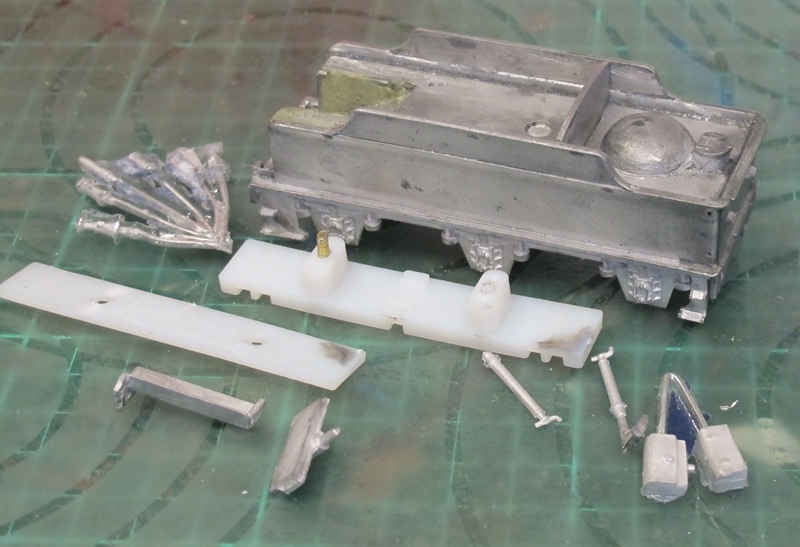 Work is now under way here on my kitchen table Starting with "Dog" number 1 The K's Bulldog class White metal kit. I have started with the tender as I "thought" this would be the easy bit! Not bloody likely! The castings although reasonable in terms of moulding flash, (although there is a fair bit of fettling) were slightly distorted and took a while to get reasonably straight. There is still loads to do on the tender but you can see the basic body shell coming together. Another couple of sessions between other jobs on the bench should see the tender finished. Following on from the (Almost) completed engine shed for my Penmaenpool MPD module of my new layout "Steam on the Cambrian" I thought about adding some internal detail to the shed building. To be honest though, I wonder if it is worth it as very little detail will be seen in the Stygian gloom of the typical steam running shed. Anyway, to pass a few hours away I made these few items. 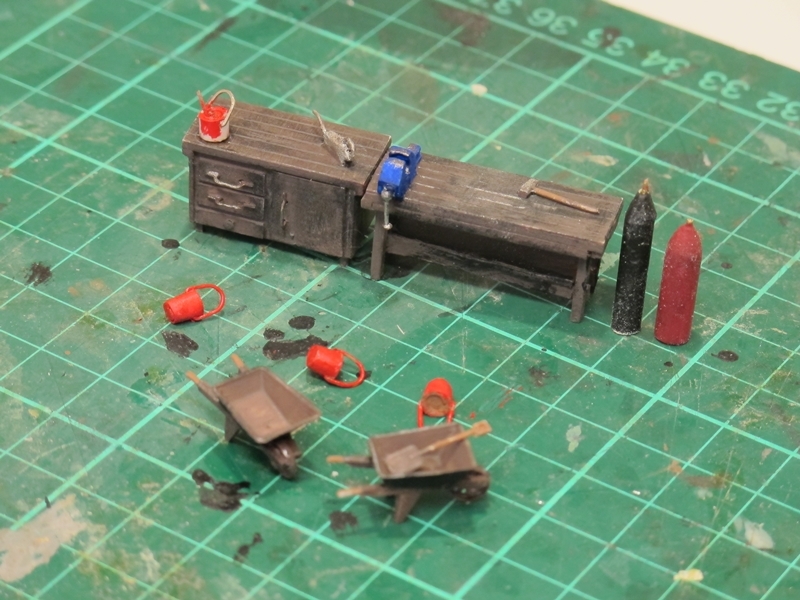 Made mostly from scrap pieces of styrene section and Plasticard a few hours produced all these fitters tools and benches. Sure there are suppliers of most of this stuff and you could buy most of these items ready made in cast white metal. But, have you seen the prices of some of these items? Now I'm not tight with my cash but to be fair I would rather use the money to buy other luxuries like FOOD! This little lot would probably set you back about a tenner bought from your local model shop. As it happens this lot cost me next to nothing! Just using scraps from my odds and ends boxes. The fire buckets are made from 4mm dia styrene tube, filed to a taper and a 0.3mm wire handle made and fitted. The bucket was filled with Miliput and set aside to set up. Same thing for the gas welding cylinders, 4mm dia tube for the oxygen cylinder and 5mm dia for the acetylene bottle. Filled with Milliput and shaped to form the top. A stub of 0.7mm brass wire makes the valve on the top. The vice was carved, cut, filed and sanded from a piece of 4mm x 3mm styrene section. A 4mm scale handrail knob and Peco black track pin form the handle. Same goes for the oil can, 4mm x 3mm styrene hacked, sawn, filed and sanded to shape, some nickel/silver wire makes the handle and spout. The benches should take no explanation. Just scraps of plasticard and a drop of MEK. 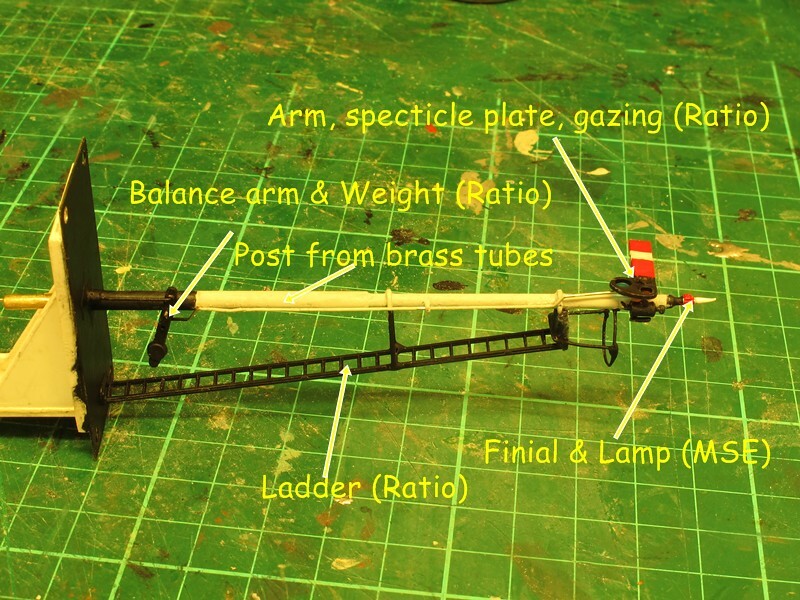 Handles from brass wire and Peco track pin. That's it! Easy peasy! 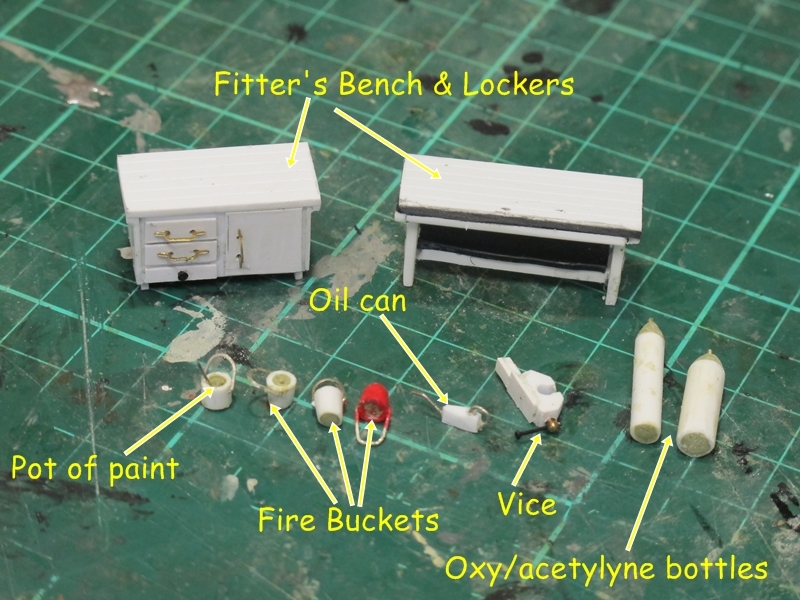 Here's a picture of some of the above items painted and ready to go inside the engine shed. 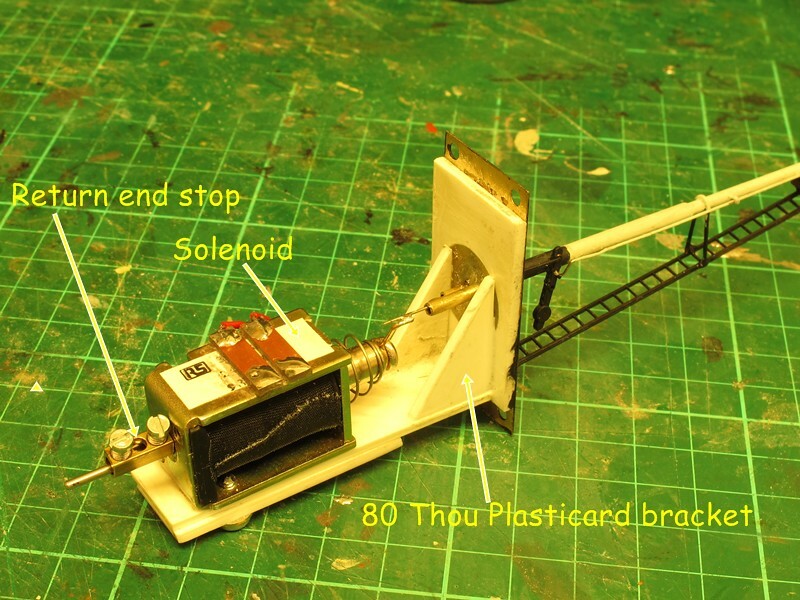 I forgot to mention, I also made a paint can from 4mm styrene tube wire and a dash of paint. Also in this picture are a couple of wheel barrows from a Coopercraft kit I had lying around. So there we have it, a couple of afternoons pleasurable work and another few bob saved into the bargain, This is what I call railway "Modelling"
Needing a place indoors where it is reasonably warm and out of the way of Mad Milo (The Dog!) and rather than working in a cold shed outside during the winter meant some negotiating with SWMBO! After much discussion it was agreed that we could dump the old kitchen table that I had used for my model work over the last 18 months since moving here, and get a new work station from those marvellous Swedish people at IKEA. A Micke desk and an Alex drawer unit with another Alex shelf with drawers. 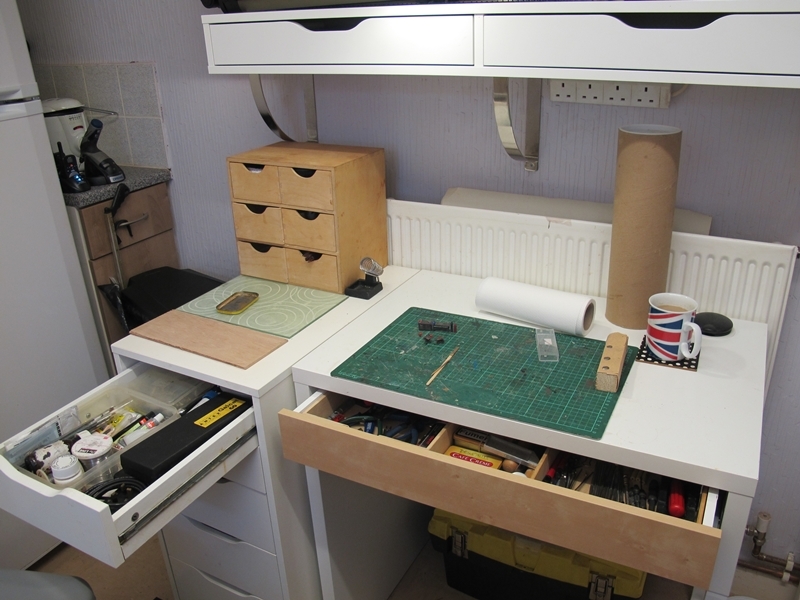 It holds all my modelling stuff Tools & materials and takes up just a bit more room than the table before did. I can now look forward to getting some jobs done on the bench in relative comfort. It has the other advantage of being very close to the Tea & coffee making facilities and snacks from the pantry are no problem either! OK best get on with some work then now we have the facilities! Time for another update and more pictures! 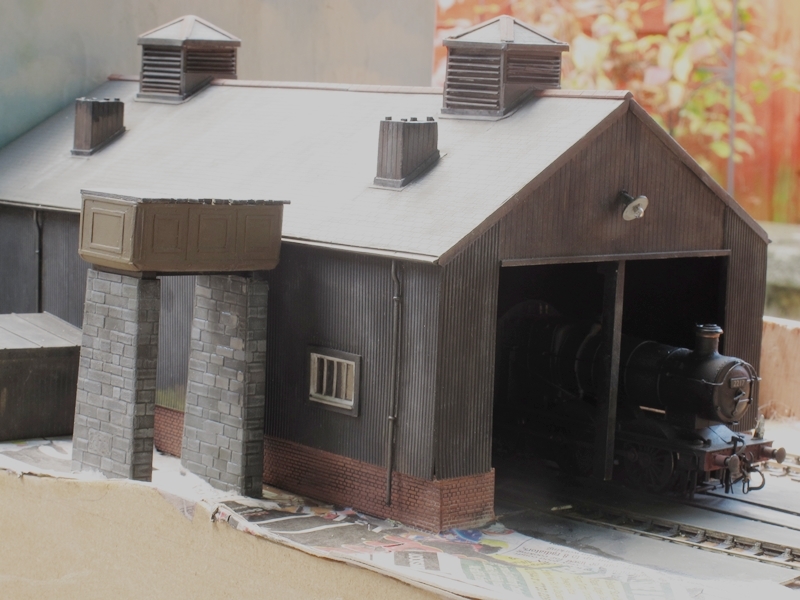 Over the last couple of weeks I have been busy building the engine shed for the Penmaenpool MPD module. 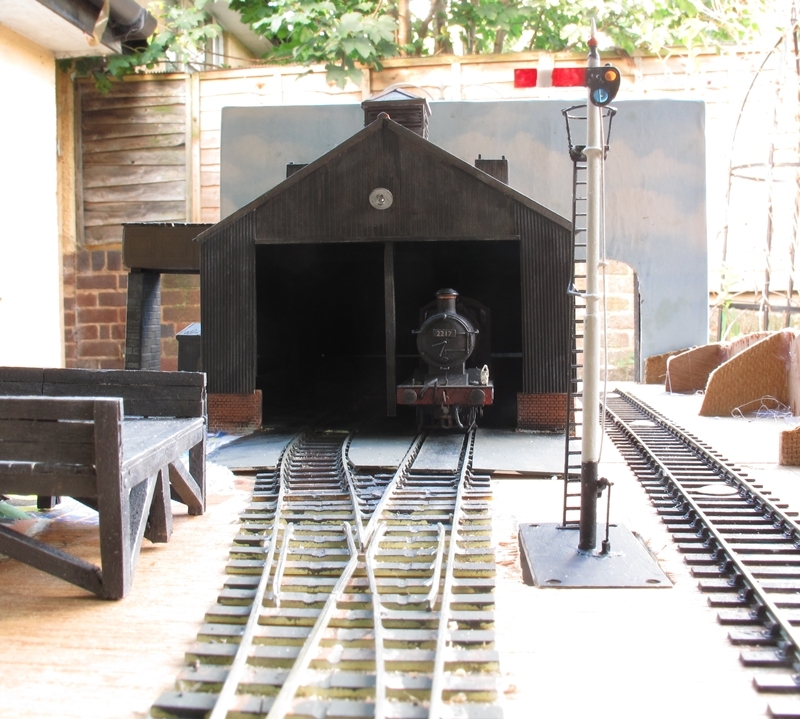 The shed is scratch built from Slaters Plasticard and some Evergreen sections. Without to much waffle here's the latest pictures showing progress. Compare the image (left) with the picture of the prototype(Below). If you think that the shed is leaning to the left, It is! It wasn't until I had uploaded the images to Flickr that I realised that the shed had not been pushed firmly "home" on it's base and by then it was too dark to retake any more. As these pictures are just WIP i will leave them for now. I was just in too much of a rush as usual! The roof of the fitters office is in the foreground, The water tank and coal stage can be seen as well as the back of the "Down" advanced starter signal. 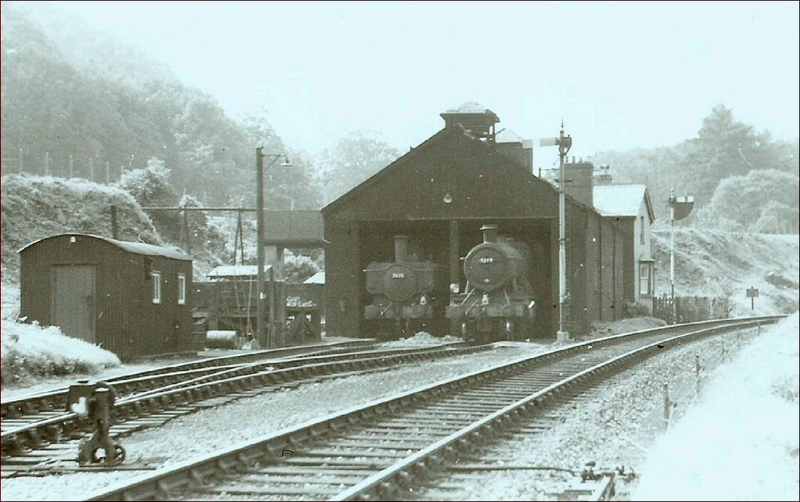 Penmaenpool shed was quite unique with the large louvred smoke vents and those slats took a fair bit of time fitting! There is still loads to do in this area, the shed itself needs some more details fitting and the interior details making and fitting also. 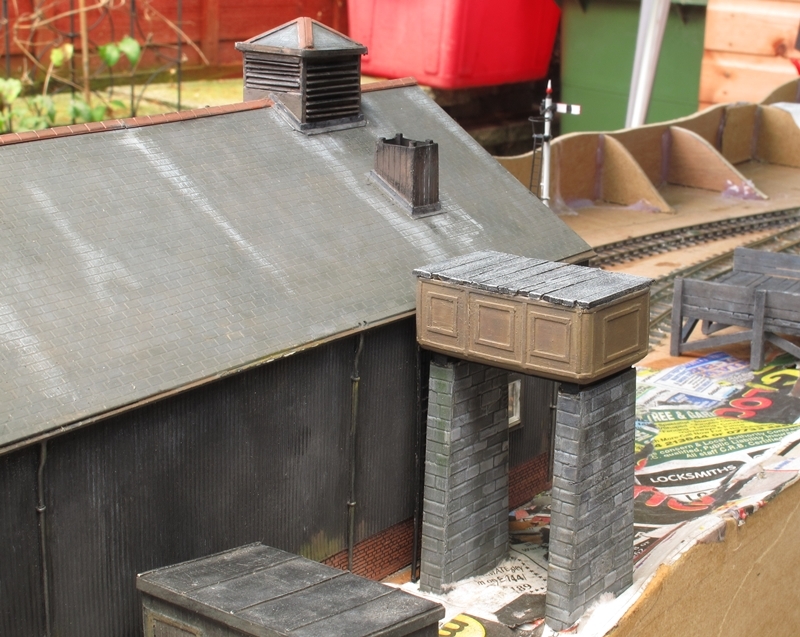 Scenery wise, you can see one of my methods of making the landscape, The profiles can be seen on the back of the module, whilst at the front I have started the landscaping using profiles with screwed up newspapers covered with a card lattice and a top coat of torn up news paper. On top of this will be a coat of "Gloop" then the ubiquitous hanging basket liner before the final vegetation and trees go in. So as you can see I have my work cut out if I want to get it out to exhibition next September! I have now completed the advanced starter signal for Penmaenpool here it is ready to "plonk" on the layout. 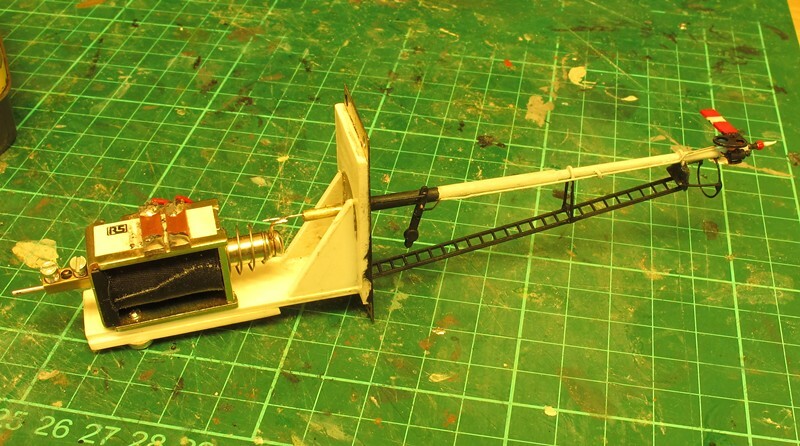 I could have just as easily gone out and purchased a RTP job from Dapol, but, as Dapol do not yet do a round steel post lower quadrant signal I made my own. The signal is a mix of bits from Ratio, MSE and home made items. Here is a couple of pictures showing the construction and what bits came from where. And, the "below ground" bit! TBH the hardest part was fitting the coloured glazing discs to the spectacle plate! Watch out for pictures of the signal installed on the layout as and when I can get a round tuit!